Beautiful hand painted original vintage movie poster of the Charlie Chaplin silent comedy, The Kid (1921) for sale. 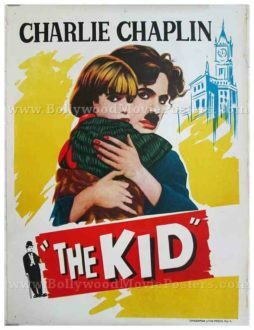 This is an actual surviving original Charlie Chaplin movie poster of The Kid, which was released in India by the National Film Development Corporation of India (NFDC). 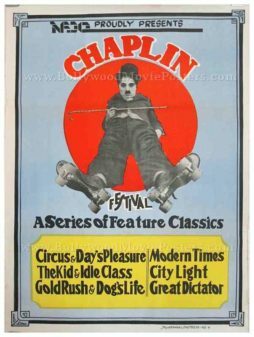 The Kid was Charlie Chaplin's first full-length movie, making this old hand drawn poster highly collectible. Designed, printed and circulated in India somewhere in the 1970s/1980s during the film's release in India, this poster was originally intended for publicity but never ended up being used. This expertly hand drawn minimalistic original poster features a stunning portrait of Charlie Chaplin in a still from the film, where he is seen holding on to his adopted son. A tiny black and white silhouette of Chaplin in his tramp avatar from the film is seen pasted at the bottom. The Kid is a 1921 silent film written, produced, directed by and starring Charlie Chaplin. This was Charlie Chaplin's first full-length movie. It was a huge success and featured an intriguing mix of comedy and drama, leading it to be labeled as a “dramedy”. In December 2011, The Kid was chosen to be preserved in the Library of Congress' National Film Registry. 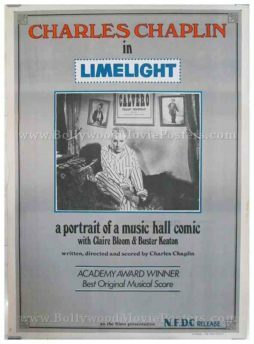 Original vintage movie poster of the Charlie Chaplin comedy, Limelight (1952) for sale. This is an actual surviving poster of Limelight, which was released in India by the National Film Development Corporation of India (NFDC). Limelight is the only film for which Charlie Chaplin received an Academy Award (the rest being honorary awards), making this poster highly collectible. Limelight is a 1952 comedy written, directed by and starring Charlie Chaplin. The film’s musical score was composed by Chaplin and arranged by Ray Rasch. The film was released amidst great scandal. While touring for the film, Chaplin was refused reentry into the United States. The film was subsequently passed over by many theaters. In 1972, the film was given a wide U.S. release and honored at the Academy Awards. Chaplin is reported to have told his older sons that he expected Limelight to be his last film. Limelight was made during a time where Chaplin was starting to lose his audience, and the fading success of his real life was mirrored by his character in the film. Hence, many believe Limelight to be somewhat autobiographical. While touring Britain to promote the film Chaplin learned that he had been refused a reentry visa to the United States because of his alleged communist sympathies, and many American theaters refused to play Limelight. It was not until 1972 that the film was finally seen in wide American release, and Chaplin, Larry Russell, and Ray Rasch received the Oscar for best original score. The film was massively popular in Japan, Europe and around the world. In the US, however, it was a relative disappointment, only taking in $1 million. Old cinema poster of the Charlie Chaplin classic comedy, A King in New York (1957) for sale. This is an actual surviving vintage movie poster of A King in New York, which was released in India by the National Film Development Corporation of India (NFDC). 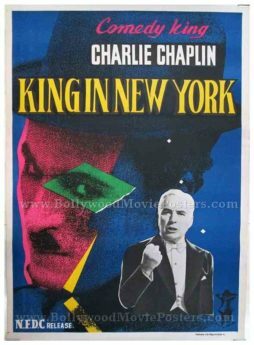 A King in New York is the last film that starred Charlie Chaplin in the lead role, making this poster highly collectible. 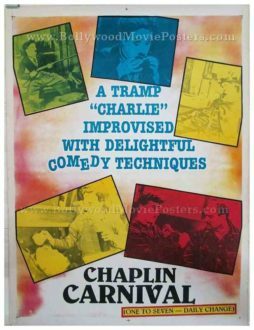 This expertly designed original movie poster features a large still photograph of Charlie Chaplin printed in an array of multiple colors. A black and white still photograph from the film is seen pasted at the bottom. 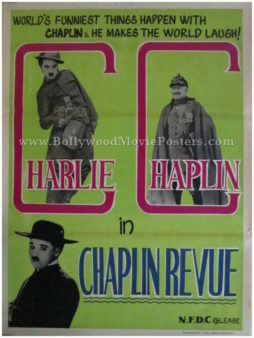 The poster introduces Charlie Chaplin as “Comedy King” on the top. A King in New York is a 1957 comedy film directed by and starring Charlie Chaplin in his last leading role. The film presents a satirical view of United States politics and society. A King in New York was produced in Europe after Charlie Chaplin's exile from the US in 1952. It wasn't released in the United States until 1967. The film did well in Europe, but its lack of US distribution severely hampered its commercial impact. Old hand drawn vintage cinema poster of the Charlie Chaplin silent classic, The Gold Rush (1925) for sale. This is an actual surviving poster of The Gold Rush that was released in India by the National Film Development Corporation of India (NFDC). The Gold Rush has been rated by some critics as the second greatest film in the history of world cinema. The Gold Rush was Charlie Chaplin's personal favorite. He is known to have stated numerous times on record that it is the one film he would like to be remembered for. The Gold Rush also has the distinction of being the first of Chaplin's silent films to be later converted into sound. This makes the poster, highly collectible. This simplistic poster features a large black and white silhouette of Charlie Chaplin set against a white background. A still photograph from the film is seen pasted at the bottom. The title of the film is highlighted in gold to match its description. The Gold Rush is a 1925 silent comedy written, produced, directed by, and starring Charlie Chaplin, who appears in his infamous Little Tramp avatar. The “roll dance” performed by Charlie Chaplin's tramp character in the film is considered one of the most memorable scenes in film history. 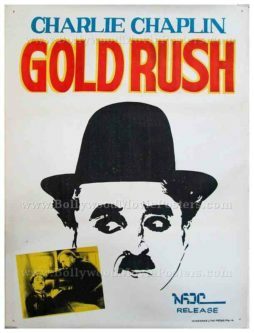 In 1942, Charlie Chaplin released a new version of The Gold Rush, taking the original silent 1925 film and composing and recording a musical score. The Gold Rush was the first of Chaplin's classic silents that he converted to a sound version in this fashion. At the 1958 Brussels World Fair, critics rated it the second greatest film in history, behind only Eisenstein's The Battleship Potemkin. In 1992 The Gold Rush was selected for preservation in the United States National Film Registry by the Library of Congress. 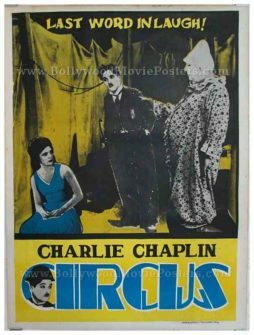 Old cinema poster of the Charlie Chaplin cult classic, The Circus (1928) for sale. This is an actual surviving poster of the The Circus that was released in India by the National Film Development Corporation of India (NFDC). The Circus is considered by many as the finest Charlie Chaplin comedy ever made. 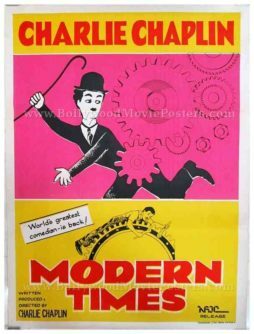 Designed, printed and circulated in India somewhere in the 1970s/1980s during the film’s release in India, this vintage Charlie Chaplin movie poster was originally intended for publicity but never ended up being used. 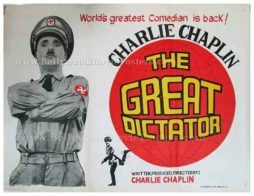 The poster features a black and white cut out photo still of Charlie Chaplin carrying his trademark walking stick. A cut out of just is face appears intertwined in the first letter of the film’s title at the bottom. The poster is very aptly titled as, “Last Word in Laugh!” on the top. The Circus is a 1928 silent film written and directed by Charlie Chaplin. The film stars Chaplin, Al Ernest Garcia, Merna Kennedy, Harry Crocker, George Davis and Henry Bergman. Chaplin’s plays appears in his iconic Little Tramp avatar as a hired clown in a circus. It is reported that The Circus was the most difficult film for Charlie Chaplin to produce due to the numerous problems he encountered at the time such as a bitter divorce from his wife, the passing away of his mother, IRS’ accusation as well as investigation of alleged tax misappropriation on his part and a studio fire that delivered a major setback to production. The Circus was the seventh highest grossing silent film ever made in the history of cinema and was well received by both critics and viewers. Charlie Chaplin was nominated for four Academy Awards for the film, which is considered by many as one of the finest Charlie Chaplin comedies ever made.